Today we had the Women’s Gold Medal game playing on our televisions in the lobby and in various classrooms throughout the school. We all wanted to be in Canada Hall to witness this game today to recreate the feeling of ’72 that some of us can still remember; I was six and have a vague recollection of sitting in my school gym. However, we are in the midst of setting up for our annual musical next week and so we watched all around the school. As we know, things didn’t look great for the Canadians with ten minutes left. But by now we know the memorable finish. 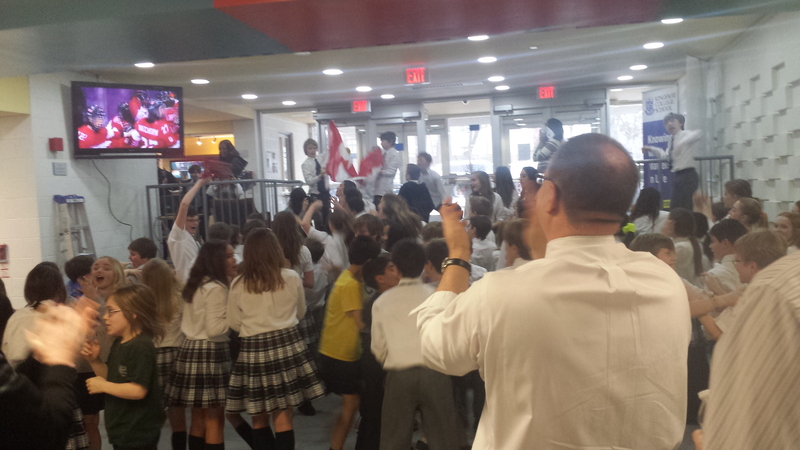 Standing with the students and staff in our upper lobby and experiencing the energy was awesome. I think Paul “Bear” Bryant, the former Alabama football coach had it right when he said about sports and its ability to bring people together, “It’s kind of hard to rally around a math class.” Let’s hope our men’s team can re-create the feeling again tomorrow in their game against the Americans. Maybe 20 years from now our students will remember where they were on February 20th, 2014, when we won Gold.